How to Expand Storage Density When Space is Limited? A big challenge for the warehousing and distribution industry is how to accommodate your operation’s growth when your existing facility is nearing its storage capacity. The good news is there are solutions that allow you to expand your storage density without having to relocate your entire operation. If your warehouse is close to or at maximum storage capacity, redesigning your floor plan could give you more storage density without having to eliminate inventory or expand into a new facility. One key redesign element to consider is adjusting your aisle width. Aisle widths fall into three categories: very narrow aisle, narrow aisles and wide aisles. Very narrow aisle widths measure 72-78 inches and are smaller than conventional racking. Reducing the aisle size can increase storage capacity by almost 50%-60% but can require specialized lift trucks for picking. In addition to aisle width, another way to increase storage density is to evaluate your vertical space. Is there opportunity to increase storage by changing your current beam elevations? If there is plenty of space above the pallets within their storage locations, new beam elevations can be considered. Can you adjust your beams within the racks to products stored to increase storage capacity? Common gap space between the top of a pallet and underside of beam usually range between 4-6 inches. Anything more than this can be considered lost space. A storage system design expert can conduct a walk through of your facility to advise you on other considerations including fire code clearances, in-rack sprinklers, lift truck height requirements and so on. Another way to increase your warehouse storage density is to avoid dead zones, or unused pallet rack storage. Dead zones can be eliminated by using dynamic racking that allow you to store more than one SKU per shelf. Dynamic racking, such as carton flow, allows you to load all the SKUs behind each other on inclined rollers. Once one product is picked, the next flows to the front for picking allowing more SKUs in less space. Dynamic flow racking not only maximizes storage density but increases order fulfillment processes by reducing travel times between picks. If you have available floor space to add more racking, consider adding a pick module as opposed to a basic rack system of only frames and beams. 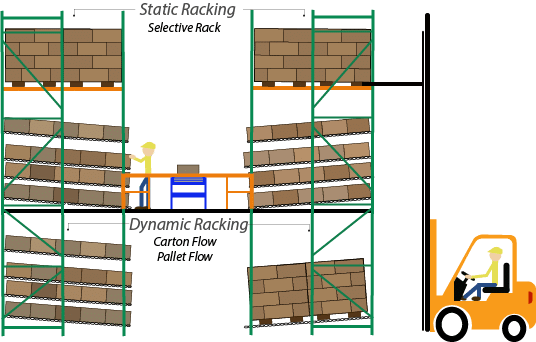 Integrating a pick module to your existing facility can increase storage density because it provides more density and selectivity compared to a standard pallet rack system. A pick module is a high-density, often multi-level storage unit that’s composed of dynamic and static racking systems and can incorporate mezzanines, conveyors and other material handling equipment. Pick modules take advantage of vertical space within your warehouse, so it frees up valuable floor space that can be used for more storage. Pick modules are also designed to advance the efficiency of product flow by reducing walking and/or equipment travel times. Need to expand your storage density? For more information on how you can expand your storage density in your existing facility, fill in the ‘Submit Your Inquiry’ form. Our industry experts can help you answer any questions regarding re-configuring your existing layout and provide you with the solutions to meet your operation’s storage needs. Still need to research further? This case study showcases how one company was provided a design that allows them to reconfigure their layout to incorporate a very narrow aisle width to accommodate their future growth. In this case study, learn how this company expanded their climate-controlled distribution center with integrating a rack supported cooler and freezer. Because the rack system serves as the structural base, it eliminated the need for columns and provided higher storage density. How can outdoor storage work for you? What are FIFO & LIFO Inventory Management Systems? Why do some racks fall when they collide? Is your warehouse ready for Christmas? No.619 Weizhou Road, Weifang, Shandong, China. Copyright@ All Rights Reserved. Shandong Topeasy Industrial Equipment Co.,Ltd.